When a webpage links to another webpage, it’s called a backlink. Backlinks are essentially incoming links to a webpage from another website. Commonly known as “incoming links”, backlinks connect through external websites. The number of backlinks can be an indicator of the importance and originality of that website. Not only are backlinks one of the factors that determine how well your webpages rank, these links can also determine how those webpages are found. Anchor Text: This is the text that is highlighted in a hypertext link. It usually appears as blue underlined text, but it can be changed to different colors. Anchor text should be relevant to the webpage you’re linking to, instead of generic text. Clicking on this text brings the user directly to the webpage. Do-Follow Link: These links can be added into a blog post or webpage. They allow search engines to follow and reach a website. Do-follow links can boost SEO optimization by helping improve the webpage’s ranking. A Do-Follow link can pass the SEO strength, or “PageRank” of the page it resides on, to the site that it links to. No-Follow Tag: This indicates to search engines that a given link should not influence the ranking of the link’s target in the search engine’s index. It is a way to tell search engines that a given link should not be counted as a “vote” in favor of that content. No-Follow Link: These are links that link to another website, but the link contains a no-follow tag. They don’t boost page ranks to improve the overall ranking and SEO optimization of the site. No-Follow links do not improve your ranking, pass you DA, and from a Google index perspective have no value. There are ways to get value from no-follow links, which would be its own blog topic. High-Quality Link: A high-quality link is a link that comes from a high-quality site, containing consistent readership, traffic flow, ranks for valuable relevant keywords to your business, offering value to the sites visitors. The link should link to your website preferably using your keywords or keyword phrases that you wish to rank for. These links can give your website a ranking boost. Low-Quality Link: These are the links that come from websites that have a low ranking potential or value and should not be trusted (i.e. automated sites, spam sites). If the link does not appear to be natural, it probably isn’t. If a link violates Google’s guidelines, consider it a low quality link. Internal Link: Internal Links are hyperlinks that point at the same domain as the domain that the link exists on. They are the links that go from page to page within the same domain. They are commonly used in main navigation for a website or as a way to connect website content in a positive way for the user of the site. Linking Root Domain: Linking Root Domains are the number of other sites that link to your page/site. These are the backlinks coming into the website from a specific domain. These do not include multiple links to a website if the links come from the same domain. Link Juice: Link Juice refers to the value or equity passed from one page or site to another. This value is passed through hyperlinks. Search engines see links as votes by other websites that your page is valuable and worth promoting. Comparable to a citation, backlinks are crucial for successful SEO campaigns. Backlinks are one signal that impacts a website’s ranking when searching online. Backlinks can indicate an interest in your website or company. If numerous sites link to the same website or webpage, search engines will more likely value that website’s content, providing the content is unique, accurate, and well written. Essentially, backlinks are similar to ratings. The more rankings or links a particular webpage has from another website, the more likely a user would go to that website and actually use it to their benefit. Important aspects of backlinks are that they should be natural, valuable, and relevant. A backlink should not seem forced or artificial, should relate to the website or webpage it is linking to and should positively contribute. For example, let’s say a restaurant webpage receives a backlink from a popular food review or critic website. The restaurant site has gained a valuable and natural backlink from the food review site because both websites can compare and share information about food and similar topics. For example, the restaurant may want to determine how to develop a larger business by catering to the surrounding area. The food review website can share what they have seen as positive and negative attributes of surrounding restaurants and pass that on to the restaurant. Backlinks encourage better search engine rankings, and thus, improving overall organic search and rankings. If your webpages are receiving valuable links from other sites, those links will most likely rank higher. Backlinks help search engines find links to your site to improve crawling and indexing processes. Lastly, they help gain referral traffic, which allows for more users to visit your site from valuable/legitimate websites. In order to develop a strong ranking profile, it is better to obtain good quality backlinks (from trusted sites with good content), rather than just trying to increase the number of backlinks with low quality backlinks. Often, websites have too many backlinks that don’t contribute to the value of their site and most importantly their clients and potential clients. 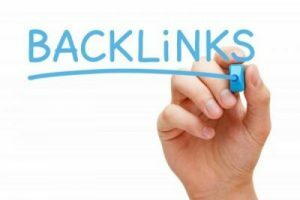 Having backlinks that supplements your content and improve your website or webpage’s ranking is much more important than just having a large number of low quality backlinks that do not help improve your site. Content is perhaps the most important aspect of a websites profile. Websites that produce valuable content have more successful SEO campaigns and websites. Good backlinks signal to Google that your website is a quality and reliable resource. The easiest way to get backlinks is to start writing and publishing quality content. If you write relatable and interesting articles, people will want to click on them and share them. Once articles are being shared at a fast pace, the higher the chances the writing will go viral and grab attention of companies, websites and individual people. Commenting on well-liked and shared blogs will help with getting backlinks because of an increase in traffic and search visibility. Commenting on relevant blogs will be the most useful. Starting public forums and linking to blog posts in those discussions is another way to increase the chances of getting backlinks, but make sure these forums are easy to navigate and credible. Submitting to top social media networking sites will aid in helping blogs go viral. Writing the right post for the right site is crucial. You should not writing posts for random sites in hopes of getting your backlinks posted on those websites. To build backlinks to your site, each link should be monitored to ensure it carries value to your SEO campaign. If you build your backlinks in a smart and cautious manner, you will receive positive feedback. What Should I Not Do With A Backlink? Although backlinks can seem complicated, the simpler they are, the more successful they tend to be. Backlinks should not have only specific anchor text. This can look automated and this type of behavior may lead search engines to penalize your site. There shouldn’t be any inappropriate or odd behavior when creating backlinks. This includes asking websites to put your links on their site, offering to pay for links, cross-linking with another site and excessively publishing content to your site related to your links. Regardless of the amount of backlinks a site gets, it will fail if the content is not original with high quality. Increasing SEO campaigns, encouraging better search engine rankings, improving organic ranking and search results, and developing a stronger website are just a few reasons why using backlinks is beneficial. Remember, creating good quality content that is easy to read and navigate, should be your primary goal. Backlinks can contribute to higher rankings and a better user experience. The longevity and prosperity of local businesses is largely determined by the ranking, reputation, and revenue they generate over time. There are many ways to maximize ranking, reputation, and revenue, but inclusion in local business listings, both in print and online, remains one of the most effective and essential strategies to increase visibility and enhance bottom line results. Local business listings provide the foundation for successful business marketing. In fact, listed businesses have significantly higher ranking, reputation, and revenue than their unlisted counterparts; especially if they are listed on multiple online platforms. Today, internet marketing is all but a necessity for local businesses. If your brick and mortar business does not also have a robust online presence, it might as well be invisible to consumers. But, how exactly did we get here and what are the advantages of web-based listings? Let’s explore the evolution of business listings, including their ubiquitous online presence, in more detail. While many of these marketing strategies remain prevalent, the growing consensus among business owners and marketing experts is that traditional, offline advertising is costly, competitive, and untenable in the long-term. Our fingers may still be doing the walking, so to speak, but customers no longer need to leaf through print brochures, directories, magazines, or newspapers to find the local businesses they need. In the Information Age, consumers anywhere can, with a few quick keystrokes, instantly connect with local businesses via digital listings on major platforms like Bing Places for Business and Google My Business Listing. Welcome to the future! Smartphones, tablets, and PCs have facilitated a vast and virtually constant online presence. Consider the following statistics: 96% of local searches are conducted by PC owners; 64% of local customers use search engines and directories to find local businesses; 50% of local mobile searchers search for business information (company name, address, or number); and 46% of all Google searches are local. * These statistics suggest that customers use the internet exponentially more than any other medium to search for local businesses. Done correctly, local business listings are extremely informative. From a single listing, customers can discover your business, find out where it is located, learn what products and services are offered, what offers and promotions are available, who the core clientele is, and how satisfied former and current customers are. Many local listings also support images, videos, virtual tours, and live links to social media profiles, thus enabling customers to interact with the business and/or business representatives directly. The quality of your business listing is directly related to your search engine optimization and how well you use keywords and key phrases. SEO is an essential component of improving your local search engine rankings and driving search traffic to your website. The more consistent and comprehensive your business listing, the higher your ranking, reputation, and revenue. Digital listings have certainly revolutionized how local businesses promote their products and services. 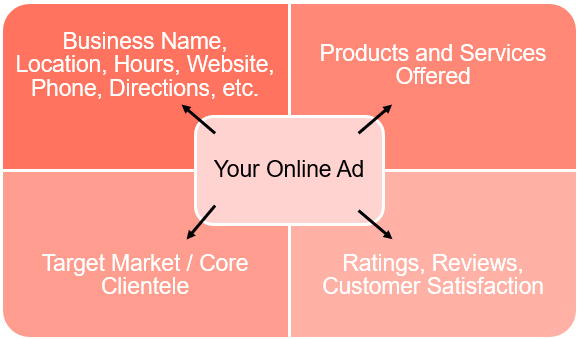 That said, however, the advertising potential of local business listings is contingent upon the platform(s) you use. A strong online presence is important, so you must choose local business directories that will enhance your Local SEO efforts. Ideally, you want your business information listed on platforms that generate high volumes of search traffic. Presence on major directories such as Bing Places for Business, Google My Business Listing, Google+, Facebook, Foursquare, Superpages, and Yelp means your business will be visible to a vast audience of local searchers. Anyone who has performed a search for a local business recently knows the extent to which local directories dominate the initial pages of their search results. It stands to reason, then, that local directory marketing has a higher conversion rate than most other advertising options. Listing your business in the most relevant, quality directories increases the probability that your business will be searched for, and found by, the quality – and qualified – customers you want. As your business gains traction and spreads across the web, you can join more niche platforms specific to the industry and geography of your company. If you need assistance creating an online listing for your local business, Perfexion, Inc. is here to help. Our qualified professionals specialize in managing and maximizing clients’ web content, ranking, and search results traffic. For webmasters, content developers, and business owners alike, search engine optimization, or SEO, is an essential part of driving search traffic to your website. There are several ways to enhance SEO and improve rank and visibility on search engine results pages, but using long-tail keywords remains one of the most important and effective strategies for increased optimization. Long-tail keywords are specific keyword phrases, containing approximately three to six words, which generate the most relevant results concordant with your search. Keywords: What Are They Used For? Keywords provide the foundation for search engine optimization. They are the words or phrases that, when entered into search engines such as Google and Yahoo, yield hundreds of results pages in seconds. Search engines expedite and simplify the research process, but it is important to remember that the quality and relevancy of the results you see depends largely on the keywords and phrases you specified at the start of your search. Let’s explore some of the pros and cons associated with short- and long-tail keywords in more detail. Short-tail keywords are succinct and consist only of one or two words. Many users, especially those conducting general research on a given topic, find the copious results pages generated by short-tail keywords both expedient and informative. From a business and marketing perspective, however, short-tail keywords are costly, competitive, and largely unsustainable. While popular head terms like digital marketing and online blogging generate high volumes of organic search traffic (that is, the shorter the keyword, the higher the volume), they tend to have abysmally low conversion rates. This may seem paradoxical, but it actually makes perfect sense. Remember that, of the millions of searches in which your chosen keywords appear, only a handful of the users who encounter them are your target audience. Although your search traffic volume is high, the trade-off is that very few users will actually browse your site and/or become a customer. Conversely, long-tail keywords are lengthier and tend to yield more specific and relevant results. Many users, especially those looking for a certain business, product, or service, prefer long-tail keywords as a way to streamline and refine their search. Which of the following search terms do you think will return the best, most specific results – socks or red and black argyle socks for men? While long-tail keywords typically generate less organic search traffic (that is, the longer the keyword, the less the volume), what they lack in volume, they make up for with consistent, stable conversion rates. The targeted nature of long-tail search traffic—coupled with lower costs, minimal competition, and relevant clicks and queries—increases the probability that you will find your ideal customers, and that your ideal customers will, in turn, find you. • According to web experts*, long-tail keywords account for 70% of all search volume traffic, which suggests that most of your website traffic is contingent upon, and generated by, long-tail searches. If you want further proof, data from Google Analytics will likely support the assertion that a majority of the queries made with respect to your website or the products and services you offer contain long-tail keywords. • A robust correlation exists between long-tail keywords and increased conversion rates. 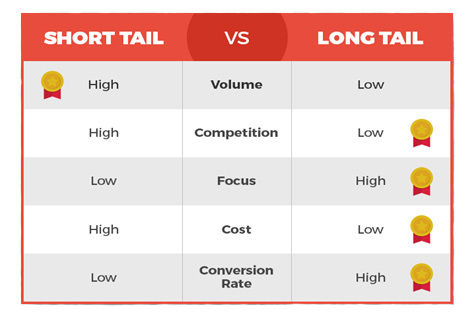 Statistics indicate that the average conversion rate for long-tail keywords is 36%. Although conversation rates are constantly in flux (and vary depending on the products being sold and the demand for them at a given time) the specificity of long-tail keywords increases the likelihood that customers will visit your site and purchase from your company. • As an addendum to the preceding point, even if a customer does not make a purchase during their initial visit, if they find your website useful—that is, if your website features products and information specific to their needs—they are likely to return and share your site with others. • Long-tail keywords have a higher optimization ranking than short-tail keywords. While the type of search potential customers perform depends entirely on the type of business you own (and on the type of traffic you hope to generate), long-tail keywords outperform short-tail terms in four out of five categories including competition, focus, cost, and conversion rate. • Done correctly, long-tail keywords provide useful and necessary context to your digital content. Without proper context, the intent and use of your selected keywords may confuse or mislead users, or even direct them to a different web page or website altogether, and thereby return the exact opposite results you want. Popular search engines like Google, Bing, and Yahoo give higher ranking and visibility to keywords that are contextualized in sentences, paragraphs, webpages, etc. • How people search for information on the internet is, without a doubt, changing rapidly. Voice assistants like Amazon Echo and Google Home are revolutionizing information input, output, and the role of SEO generally. Long-tail keywords will drive voice searches in the future, but first, voice assistants must be trained to receive, process, and compute long-tail keywords into relevant information as effectively as search engines do. Although this blog focuses on using long-tail keywords to improve SEO, it is important to remember that keyword marketing is unique for every business; there is no one-size-fits-all strategy for keyword searches. That said, current SEO campaigns emphasize the importance of the user experience and intent, so, whichever keywords you choose—long-tail or short-tail—make them as user-friendly as possible. If you want to learn more about how long-tail keywords enhance your online SEO and/or how to successfully integrate them in your digital marketing efforts, Perfexion, Inc. is here to help. We specialize in managing and maximizing our clients’ web content, ranking, and search results traffic. Any web developer worth his or her salt is an expert at both off-page and on-page SEO. Simply put, good on-page SEO means a website contains content that is optimized for certain keywords and phrases so that the site’s search rankings and relevance to users are improved. Good off-page SEO means a site gains authority and relevance by building and effectively managing backlinks from other relevant, authoritative sources. 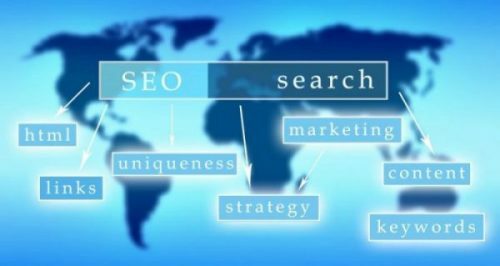 All that attention and focus on having just the right on- and off-page SEO will go to waste if the technical aspects of SEO are ignored or improperly handled. The following checklist contains recommendations for achieving the best results in terms of your site’s user experience, search engine crawling, indexing, and of course, ranking. Set up and manage your website’s sitemap: A sitemap informs search engines about how your website is structured. Make sure your sitemap is clean/error-free, updated when content is posted or removed, concise so crawls can be more effective, and registered in Google Search Console. Check the pages on your website that are indexed by the various search engines, including those that have been restricted from indexing, to make sure the number of pages indexed is about the same as the number of pages on your website. Enhance the frequency with which search engines crawl the pages of your website during a specific period of time – your crawl budget. Google statistics provide the average number of times the pages of your site are crawled daily, and from that you can calculate your monthly crawl budget. Use that intelligence to maximize the crawls that are being performed. How? By removing duplicate content, restricting indexing on pages that don’t support SEO, making crawling more efficient by adding URL parameters, and fixing broken links and redirects. Audit your site’s internal links to make sure the structure of your site is both logical and shallow. For example, check to ensure your site’s important pages are reachable within three clicks of the homepage (the depth of your pages). When fixing broken links, look for those that could be hidden in link tags, sitemaps, and HTTP headers. Address linking on orphan pages to make it easier for visitors and search engines to find them. Audit your website for HTTPS issues that could affect your site’s ranking. Check the different types of content on pages you believe are secure; if you have mixed content, it could be coming from an HTTP connection that is not secure which, in effect, makes your page less secure and can even stop a browser from loading it altogether. Make sure all the links, redirects, and canonical URLs point directly to HTTPS pages to reduce/eliminate the number of unnecessary redirects, which make a website appear slow and eat away at your crawl budget. If your site is still HTTP, consider migrating to HTTPS, given that Google uses HTTPS as one of its ranking signals. Make sure your site’s pages load in two seconds or less. Google factors speed when ranking a site, and a page that loads quickly and efficiently provides an optimum user experience as well as improves your bounce and conversion rates because users will be less inclined to click away from a page that has loaded quickly. Prioritize the mobile friendliness of your website and perform an in-depth audit of the site. With search queries from mobile devices on a steady rise, Google is planning to change how it indexes website pages. They will soon begin indexing mobile versions of websites first, rather than their desktop versions. Google provides a mobile-friendly test that lets you check a variety of criteria such as text size, plugins, how pages are viewed, and more. The key is to perform the test on every landing page of your site, since Google determines mobile friendliness on a page by page basis. Just as you need to restart your computer for software updates to take effect, you should have search engines re-crawl your website to make sure fixes and changes you make to your site go immediately into effect. You can submit requests to Google and Bing to re-crawl and re-index on a URL basis or on your entire website. By systematically addressing the technical areas of your website that impact SEO, you both improve the ability of your site to rank well in searches and enhance the user experience across the entire site. The end results are well worth the effort. At Perfexion, Inc. we specialize in making sure clients’ websites are technically sound and perform to the best of their ability. Note: Thanks to Link-Assistant.com (https://www.link-assistant.com/news/technical-seo-audit.html) for the valuable tips presented here. Search Engine Optimization – SEO – is a tool used by web developers and digital marketers. Its purpose is to enhance the visibility of a website or web page in search engine results so that, when a user performs a search using their preferred search engine – Google, Yahoo, or Bing – the website or information the user searched for appears at or near the top of the list on the search engine results page, or SERP. 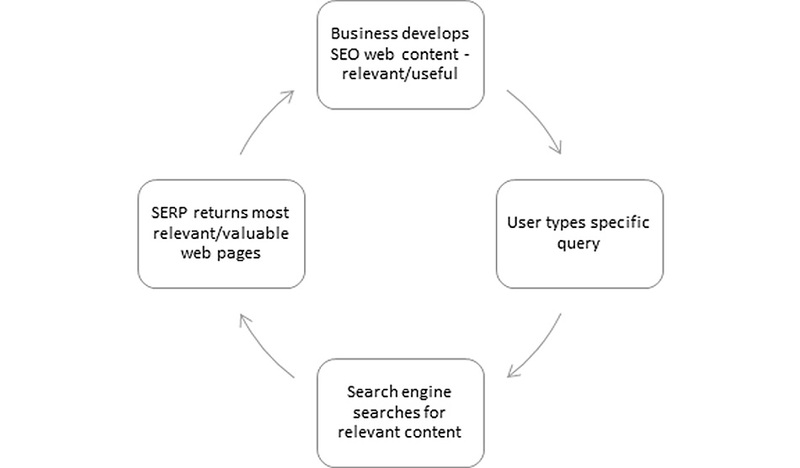 When a user performs a search, they enter a word or series of words in their search engine’s search box and wait for the search engine to provide its results. The words a user types are called keywords, and users generally know the keywords they type should be specific, rather than general, to get the best results from their search. For example, if a user enters the word “sweater,” they’ll receive hundreds of billions of results. But, if they enter “fuchsia cardigan sweater under $20 in size 8,” the number of results returned decreases considerably. This type of search query is called a natural search, and the results returned are called organic or unpaid search results. In a matter of seconds, or split seconds, search engines process through billions of entries in their index and return results that are the most relevant to the search terms used. They analyze the keywords entered as well as the larger context of the query to match these with websites, web pages, etc., that are useful, informational, and relevant. These results are typically listed on the left-hand side of the search engine results page. Websites and webpages with a well-organized, well-managed SEO strategy have increased chances of appearing at or near the top of the list on SERP. Early on, SEO relied on the repeated use of keywords and links in web pages. Copywriters crammed pages with keywords to the point the content was both awkward and poorly written – all in an attempt to outsmart the likes of Google. In time, search engines saw what was happening and updated and changed their search algorithms. In effect, so users would be satisfied with the search results they received and so businesses would improve the content on their websites and basically have to compete to appear high on the SERPs. If you’re starting to see a connection between users, websites, search engines, and search engine results pages, it’s because one exists. A user performs a query using certain key words and phrases. A website is written and designed in anticipation of how a user – the business’s target audience or customer – searches for the product/service offering or information provided on the website. Search engines look for web content that contains indicators of value in response to the user’s search, such as links, images, and other relevant content on a website. The SERP lists websites/web pages that have the highest SEO relevance and value based on 1) how the user queried and 2) how valuable web content is. The successful marketing of any business online requires a thoughtful SEO strategy. SEO requires business owners and marketers to fully understand their audience – both existing customers and their target market – and work to align web content to react appropriately to what the customer wants and how they ask for it. Businesses need to closely examine just how their target market searches for products/services online. Today, SEO and the power behind search engines go far beyond filling a web page with keywords and matching a user’s search terms with the keywords on the website. That is because search engines rely on more than keywords when providing results to a query. They look for web content that is appealing. Content must be useful, informative, and interesting. It must respond to whatever type of request a user makes, whether it is to buy a product, solve a problem, learn how to do something, hire a service, watch a video, and more. While SEO values the content that is visible on-screen, that is, the words, images, etc., everything that goes on behind the scenes – technical SEO – is equally important. Technical SEO is what helps search engines crawl to your website and index it. Web developers, those who handle the technical aspects of SEO, understand the techniques search engines use to access and crawl to websites, and they make sure their clients’ websites are in alignment with those techniques. Developers are necessary for improving SEO for a variety of reasons, such as conducting SEO audits to locate issues that impede crawling; eliminating duplicate content; fixing errors; and making sure content all links and pages work the way they’re supposed to. They, along with digital marketing experts, follow all trends, practices, and updates relating to search engine optimization. As experts, they understand the trends and how they relate to the digital marketing efforts of their clients. The web developers at Perfexion, Inc. specialize in SEO and the entire gamut of online marketing channels and strategies. They pride themselves on ensuring clients’ SEO and digital marketing efforts perform at optimum levels and that their digital marketing investment always provides a positive return. We are a Philadelphia based web design and development company located in Plymouth Meeting just outside King of Prussia.